The Blue Cross Blue Shield (BCBS) of Oklahoma Building is a 12-story, Modern Movement style office building situated in downtown Tulsa. The building was designed and constructed in two phases with the initial construction in 1954 for the first three stories designed by the architectural firm of Koberling and Brandborg AIA. The second phase was completed in 1969 with the next nine stories designed by architect Joseph R. Koberling, AIA with engineer W. C. Roads. The Blue Cross Blue Shield of Oklahoma Building is clad in muted yellow tan brick with a flat roof and a concrete foundation. Each of the upper floors is articulated with a band of continuous fixed windows and continuous flat concrete projecting canopies on the west facing façade and the south elevation. The ground level, main entrance is articulated by two pairs of glass doors and a flat concrete projecting canopy. A bas relief in the PWA manner extends over the entrance transoms, depicts people engaged in health related work, and includes the Blue Cross and Blue Shield emblems. In March 1953, ground was broken on a new three-story structure with 40,000 square feet at 1215 South Boulder Avenue. 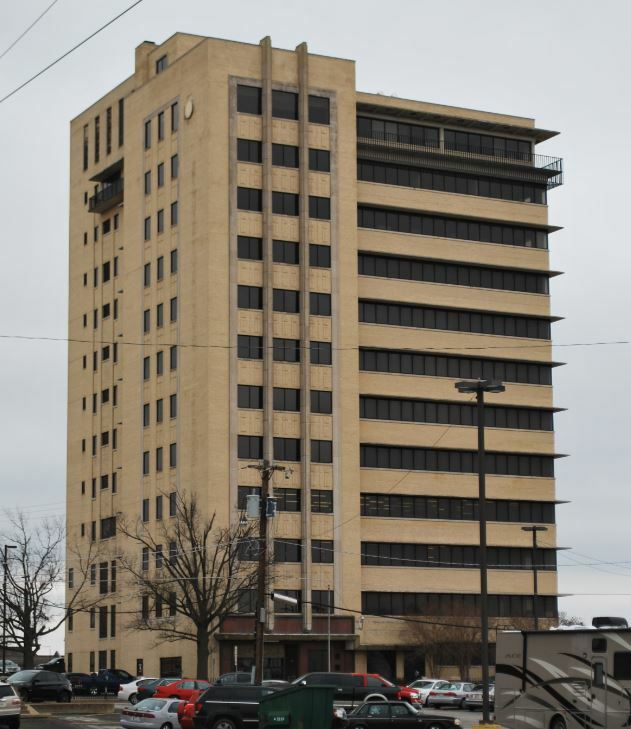 Helland, head of Blue Cross Blue Shield, had a vision for the future of BCBS of Oklahoma and ordered that the new building be designed with a structure that could accommodate an additional nine floors to be constructed as BCBS of Oklahoma grew. The 1960s was a decade of significant change for the country and also the Blue Cross Blue Shield of Oklahoma. Following the post war population growth, the baby boomer generation grew to teenagers and adults, and put a strain on the plan causing it to run in the red for several years. On July 1, 1960 federal employees were allowed to choose Blue Cross Blue Shield of Oklahoma as an option to their Federal Employee Health Benefits Program. The federal government created Medicare, signed into law by President Johnson in 1965, which was designed to meet the medical needs of a growing elderly population. With the addition of federal employees and the removal of those 65 and older, the BCBS programs moved into the black by 1966. In 1967, Blue Cross Blue Shield of Oklahoma turned again to Koberling and Roads, with new contractor W.R. Grimshaw, to add nine floors to the building. The 62,000 square foot expansion cost $2.1 million and took 2 years to complete with occupancy taking place in late August of 1969. Construction also included the installation of a revolving sign on the roof. Measuring 24 feet wide and 24 feet tall, the sign reached a total height of nearly five stories when placed on a 34 foot tall pylon on the roof. The completion of the building seemed to also result in plan membership growth. By the end of 1969 membership stood at 633,000. The Blue Cross Blue Shield of Oklahoma Building was listed in the National Register on September 12, 2016. It was listed under National Register Criterion A and C, and its NRIS number is 16000624.